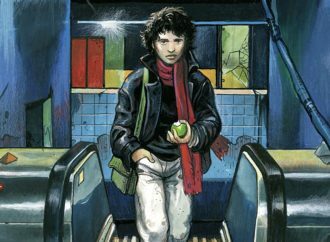 I have been a comic geek since I was thirteen. I have been a brown-skinned girl all my life. Costuming started as fun for me, but has become equal parts mission and frustration. I started cosplaying when I didn't even know the word "cosplay". And forget the resources available to cosplayers these days. Back then? I have been a comic geek since I was thirteen. I have been a brown-skinned girl all my life. Costuming started as fun for me, but has become equal parts mission and frustration. I started cosplaying when I didn’t even know the word “cosplay”. And forget the resources available to cosplayers these days. Back then? No web. No videos. Just my imagination, my ingenuity, and whatever I could buy or scrounge. 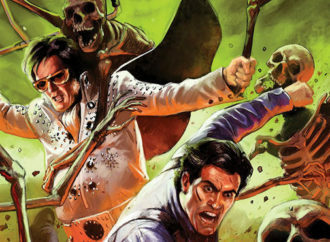 The next–and cheapest–costume I wore was Edsel from Matt Wagner’s Mage: The Hero Awakened. A cap, a tank top, a Louisville Slugger, and the cost of enough day glo spray paint to cover the bat? Done! Easy! 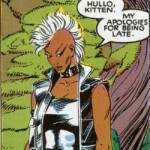 When Mohawk Storm made her first appearance in the 80s, I decided to dress up like her next. The outfit worked and hadn’t been that expensive to put together. Back in those days, even if I’d had the nerve to ask my mother, I couldn’t have. 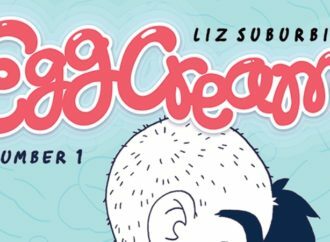 She sneered at comics and anything connected to them. She would never have backed me up with helping me make a costume. Even my Halloween costumes were mostly store-bought or sourced from stuff already around the house. It was reasonable school clothes my mother made, and That. Was. It. I had to be ingenious with what I could beg, borrow, or buy cheap. I wore my own hair–sprayed, teased to a fare-thee-well, and hairspraypainted white. I had thigh high boots, a spiked suede vest, black leather driving gloves, and–if I do say so myself–I felt and looked great. Costuming wasn’t common in those days, so I got a lot of astonished, disturbed, and amazed looks, as well as some of the most memorable compliments I’ve ever received. Sorry, the few photos there were of me in the outfit have been lost to the annals of time and ex-boyfriends. Fast-forward several years (and pounds) later. 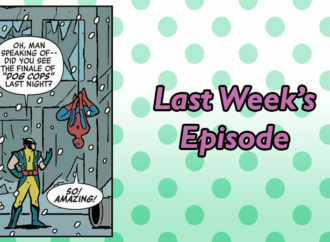 After some time away, I was getting back into comics, conventions, cartoons, and cosplay. Good friends were encouraging me to come back out of my shell and do it. I’m a bit of a perfectionist, though, and if I can’t do it close to picture perfect, I don’t wanna! 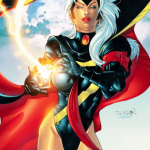 I had a great version of Storm’s X-Treme X-Men costume worked out–the one with the beautiful black swimsuit, the black cape with red lining, and yes, the thigh high boots. But the wig I’d ordered on eBay, long, thick, fluffy and white, was a failure. It was impossible to get over my dreadlocks. At the time, they were to my lower back, and showed below the length of the wig. It looked tacky to me. Any suggestions to cut my pride and joy were met with a sharp gaze and stony silence. I tried braiding them. My hair came out too thick that way; there was this unsightly lump under the wig. I tried pigtails. No joy; same result. I tried putting my hair in a snood; my hair was too heavy and fell out, leaving it dangling. After X-Treme Storm, I managed to pull together an Angelina Johnson from Harry Potter costume. A friend sewed the black wizard robe out of inexpensive fabric and was nice enough not to charge. I had a Gryffindor Quidditch Tee from the late, lamented physical Warner Bros. Store. A scarf in the appropriate colors, and that was all it took. She already wears her hair like I do. … Only to have the first person who saw me in costume greet me as “Sookie”–the blonde, white girl the series revolves around. “I ain’t Sookie!” I snapped in my best Bon Temps accent. “I’m Tara!” The guy looked surprised that I’d costumed as any other Merlotte’s waitress. But that unhappy memory was quickly replaced by a happy one. 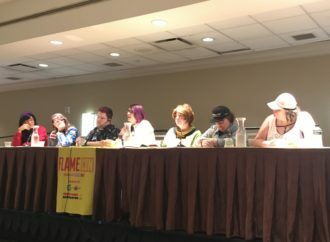 I was in the front row for the panel to see Charlaine Harris, the author of the books HBO had based their show on. And I was one Tara in a score of Merlotte’s waitresses counting multiple Sookies and Arlenes. (It was season one. None of the others had showed up yet.) Someone promised to email me the photo, but they never did. The costume remains a handy fallback. It wasn’t long before I sunk into cosplay dismay again. Who else could I cosplay? Dani again? Maybe I could braid my hair and do a faux-Valkyrie helmet, but I was daunted by the idea (and expense) of pulling off a realistic looking helmet. John Emdall from cult fave Buckaroo Banzai: Across the Eighth Dimension? Would anybody even know who that was? 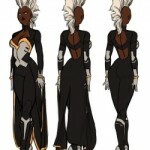 DC Comics’ Vixen? No. They’d done away with her long braids and put her back in the orange togs–orange is not a color I wear well. DC’s XS? I’d already had trouble with a Storm-length wig. No way could I pull off XS’s short little ‘do. Marvel’s Cecilia Reyes? She still has her braids, but she’s not a big enough name that anyone would recognize her; and for that matter, she doesn’t even wear an X-Men costume! 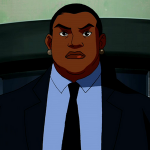 DC’s Amanda Waller? Walking around in costume is uncomfortable enough, and pricey to put together. But to wear a business suit and heels all day on top of it, looking like someone who didn’t belong at a convention at all? Not to mention the short hair. Perish the thought. One of the Djinn from the Weather Warden series of books? 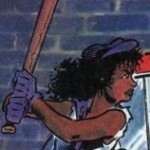 She had the right hair, but I eventually nixed that idea for having the same problem as the Waller costume. Plus, while it’s cool to cosplay as someone an author wrote, it is beyond tiresome to repeatedly answer “who are you?” to people when you don’t have a costume with instant recognizability factor. Idie “Oya” Okonkwo? She wears an afro and is only fourteen. I probably cannot pull off fourteen reasonably, and the outfit would come off as schoolgirl fetish if I wore it. Ew. Orange Blossom from Strawberry Shortcake? Relaxed hair and … OK, now I’m just reaching. I considered for a while cosplaying someone my hair and my skintone wouldn’t be an obstacle to. The Diva Plavalaguna from The Fifth Element? I’m maybe a bit too short, and the price of elevator heels for that costume are nothing short of wince-worthy. Plus, thinking more seriously on it, I did the head to toe body paint for a LunaCon once when I costumed as an unnamed demon. I had remnants of it on my skin for a week afterward and had to wear long sleeves to avoid uncomfortable explanations to my mundane coworkers. I tried making my own costume that same year. Seamstressing, despite a summer sewing class in 4H during my high school years, is not a talent I possess. I was going for cyber-genie. That was an unmitigated failure, enough said. Maybe I could be ambitious like those people who dress up in full body cartoon character outfits, I thought. But that idea was kiboshed by the fact that DragonCon–the only con I can currently afford–is in Atlanta, GA, in the dog days of summer, and the rainy season to boot. I’d either die of heatstroke, or the papier mâché would not survive being sweated into or rained on. These are important cosplay considerations if you’re not walking around in some cool and dry climate. Not to mention those full-coverage mascot-style costumes are expensive. When you get down to it, I think I didn’t want body paint or full body coverage for a more important reason. No disrespect to my sisters who cosplay as Lumpy Space Princess, Starfire, or She-Hulk. It takes patience, love, and guts to paint oneself head to toe and cover up one’s own beautiful complexion. No, we will not be discussing those who do blackface to portray PoC characters. It is racist, wrong, and should not be done. For any reason. Ever. End. Of. Discussion. But say it loud: I’m black and I’m proud! I should be able to represent one of my people in costume to thank creators for giving me representation and to show that like the Whos in Horton’s Whoville, we are here! For years, I’ve been hearing the repeated and disturbing idea that “black people don’t like comics and sci-fi anyway,” and that makes it more important than ever to cosplay as somebody with brown skin. 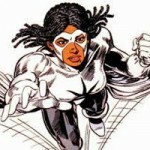 Then it hit me: Captain Marvel, Monica Rambeau! She’s wearing locs these days, right? Wrong. It was an afro when I considered it. Then they made her the whiny leader of NextWave, and the afro persisted. Then they took the Captain Marvel moniker from her. As of 2014, to add insult to injury, now that she’s back? Relaxed hair! ARGH! I loc’d my hair to get away from the pain and expense of relaxing (when I quit over 15 years ago, it was $125 a shot to have a relaxer at a salon). 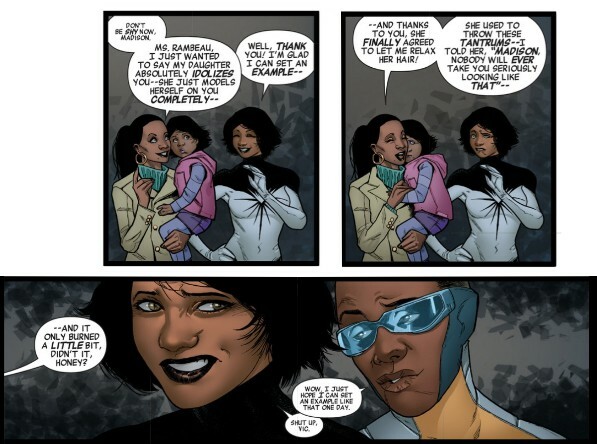 At least Mighty Avengers has the decency to acknowledge the painful aspect of black hair care, and why there are women who are willing to endure chemical burns on the scalp. In 2012, Disney did Wreck-It Ralph. 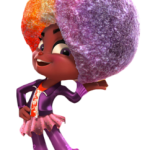 Ever on the lookout for characters of color to dress as, I was elated to see adorable Snowanna Rainbeau as one of the Sugar Rush racers. When she appeared on the screen, I turned to my boyfriend excitedly and whispered, “I’m gonna cosplay as her!” Cue the next seven months putting together the costume: painstakingly matching up outfit pieces to the few images of Snowanna I could find online. I squealed with delight finding a Snowanna doll at the Disney Store so I had an accurate model to work from. Even using eBay and paying close attention at thrift stores (thanks to another panel on the DragonCon costuming track), it turned out pretty pricey. After hours and hours of poring through YouTube videos, I now had tutorials telling me it was possible to put my locs–now four feet long–under a wig cap and thereby get a wig on over them. So I hunted and searched and found the largest wig I could afford. No joy. I could cram the locs under a wig cap, but couldn’t get the damn wig on over my hair no matter how I tried. Not even with wig tape. I tried another wig. No luck. I was determined to keep trying, though. I even researched making my own wigs. I came away impressed with the dedication of cosplayers who can do that, but too daunted to try it. There’s also the fact that most wig wefts come in straight or wavy … but not afro. I even considered getting a custom wig made. That’s another in the prohibitively expensive column. We’re talking easily $500 for a wig I might wear twice if I recycle the costume for Halloween. There’s not a lot of call for a sparkly rainbow afro wig. Come DragonCon 2013, I still hadn’t found a way to put the wig on without the same problem I’d had with the long Storm wig. Online friends suggested going without it, that people would know who I was going for. But I again felt like it was a cop-out, so I skipped the costume altogether. I still have the pieces though, should I find a way to make the afro work. Other character of color costumes might work for me. The problem there is that not every character is one that I want to wear. Tia Dalma from Disney’s Pirates of the Caribbean series? Okay, yes, she’s a woman of color, and she has locs. She turns out to be a goddess, even. But her human guise is not my idea of positive representation. Tiana from Disney’s Princess and the Frog? Costume game too weak; it’d be prohibitively expensive to pull off her dress, because I’d have to commission someone to make it. The dress alone would easily cost more than a full four day pass to a convention; I’d still have 3 days of other outfits to consider, and the cost of food, to say nothing of hotel! 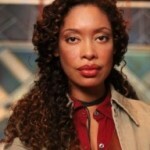 Zoe from fan favorite Firefly has long hair–in curls. 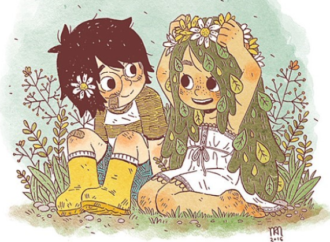 Shout out to my boyfriend, who dresses so much like Wash already that people mistook him for being in costume while wearing street clothes; we’d be cute if I did do that, and I could possibly pipe cleaner-curl my locs into a semblance of Zoe’s hairstyle. But come on, nobody does it better than Gina Torres. 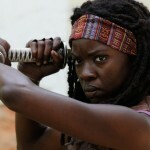 There’s always Michonne from The Walking Dead, I suppose.She is a bona fide comic book heroine, no doubt. She’s black. She’s got locs. I just can’t see myself pulling her off. I guess I don’t identify as strongly with her as I do with the other comic book and cartoon women. Or, more likely, I’m intimidated. I probably can’t do a better job than Danai Gurai already has. Monet from the all-female X-Title has naturally straight hair. That brings the arch-enemy Wig Problem back. In 2013, Cartoon Network woke the sleeping cosplay urge in me once again with Steven Universe. 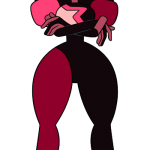 Garnet is the leader of the Crystal Gems, and while she’s technically red (as teammate Amethyst is purple and Pearl white), she has a giant afro and looks like an African American woman to me (and to a lot of the viewers). I’ve already looked up how to make her Crystal Gem gauntlets on YouTube. A pair of mirror shades should be easy enough to come by. Her Crystal Gem unitard will be the next most challenging and expensive part of her outfit. But then–Wig Problem and I must face off once more if I’m going to do it right. I couldn’t get Snowanna’s afro to work. What clever trick must I resort to if I’m going to try working it as Garnet? I shouldn’t complain, maybe. There is that beautiful cosplayer of color who did Sailor Venus and who got so much rancor for daring to dress up outside her race. There are so many people who take crap from the internet in general and from so-called journalists for daring to cosplay outside their body type. My problems are small and possibly self imposed by comparison. 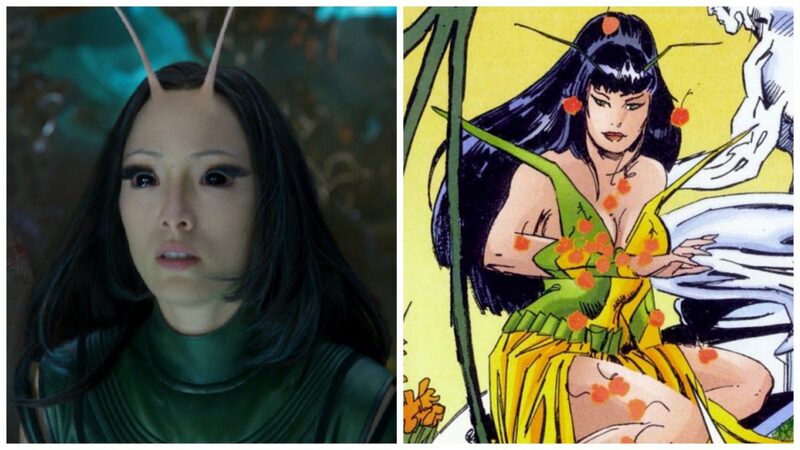 I could pull off a lochawk at least to try Storm again. Have I considered cutting my four foot long locs for costumes? At this point, yes. Multiple times. It’s only hair. It’ll grow back. But my locs have been with me for well over a decade now. Longer than some relationships. I haven’t been able to bring myself to do it just yet. For a costume? It seems a trivial reason to so dramatically change something I like a lot about myself. Besides, I’ve come across other locs-wearing cosplayers who feel the same. Our locs are part of our look, our identity. None of us want to cut them just for a costume. Maybe I just lack the commitment, because I can’t make sacrifices to my vanity or my wallet for the purposes of looking cute at a convention. Then again, there’s a wig company who swears they can get even my epic locs under a wig and make it look good. Perhaps Snowanna Rainbeau will ride again … Perhaps I’ll pull off Mohawk Storm 2014. Garnet? I may make her happen yet. Hey, my heroines of color don’t give up–neither should I. … Anybody got an idea to incorporate TARDIS technology into a wig?